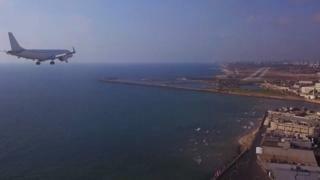 A man has been arrested on suspicion of flying a consumer drone close to planes as they prepared to land in Tel Aviv. The 21-year-old was held after footage was posted to YouTube and shared on Facebook and Twitter. Israel's Transport Ministry described a "disturbing and serious incident". The YouTube posting suggested the drone had been flying as close as 90ft (27m) to the passenger aircraft. However, the suspect was later quoted on the Hebrew-language Israel Today news site as saying that the true distance had been more than three times that figure. The video, which is still online, states a Mavic Pro drone was used to capture the footage of aeroplanes making their final descent to Sde Dov airport. In some cases, the planes appear to be the same altitude as the drone. In others, the jets are closer to the sea. The video also appears to show a man, filmed from above, controlling the drone while seated outside a bar. The edited material was uploaded to YouTube on Thursday and shared on other social media the same day. It has since clocked up more than 70,000 views, with many of the resulting comments criticising the film-maker's "stupidity" and saying that viewers had reported it to the local authorities. DJI - the Chinese-maker of the Mavic Pro - has also condemned the filming. "We stand ready to assist national aviation authorities as they investigate a recent wave of photos and videos showing clear and intentional lawbreaking in ways that pose real danger to manned air traffic," it said in a statement. DJI said its drones came equipped with software that should prevent them flying within five miles (8km) of Sde Dov airport unless the feature had been disabled. Consumer drones are an increasing headache for airport operators across the globe. Earlier this month, Gatwick Airport, near London, had to close its runway and diverted flights after a UAV (unmanned aerial vehicle) was spotted close by. The Australian Transport Safety Bureau is investigating a suspected midair collision between a drone and a light aircraft near to Adelaide. Research by Cranfield University into aircraft-drone collisions indicates they need not be fatal but lithium-ion batteries used by UAVs mean they can pose a greater threat than bird strikes.